So, you have limited cash and you want to cover stained ceiling tiles in your basement family room, main floor, or wherever they are. You have looked in the home improvement store, and almost any solution requires you to rip down those tiles and start again right? specifically designed for stained ceiling tiles. Well you don't have to do that. Maybe one day when your bank account looks a bit healthier, but for now you can work with those older style stained acoustic ceiling tiles. It can be a lot of work to take them down, so if you happen to notice they have stains on them, then don't dispair there are ways to cover these. Don't assume ceiling paint will cover them, because it won't, those sneaky stains will work their way through and you will still see them, sometimes even worse than before. Step 2 - Has the Cause of the Stain Been Fixed? - If these look like water stains, then you need to confirm that you don't have any leaks in the plumbing, but if you have been living in the house a while, and these stains look old and dry, chances are it was simply a spill on the floor above that worked its way to the basement ceiling a long time ago. But confirm they are bone dry to the touch, or you may need to address a plumbing issue. As a kid in my parents 50s house, it was all oak hardwood, that was waxed rather than varnished, and I remember spilling my drink. The hardwood floor was cleaned up instantly, but a few days later we noticed it on the basement tiles in the ceiling below. It didn't take much to get through the cracks of the hardwood. Now most hardwoods are varnished and tighter, but still you must clean up spills right away. This product can totally transform your ceiling. It is the perfect DIY to update and freshen those nasty brown and ugly stains that form on those tiles. Replacing a ceiling is expensive, so give this a try first. 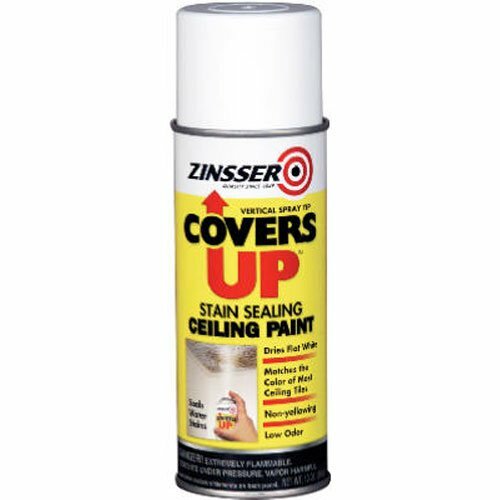 You will be pleasantly surprised as Zinsser is an awesome product for covering stains. NOTHING seeps thru. You don't want to get this product on the floor coverings or the walls. This is as easy as heading to the dollar store and getting the plastic paint sheets to hang on the walls with painters tape and something for the floor. Unless you are planning to paint the walls to, this is a necessary step but so worth it! Thanks for the great article. I have some stained ceiling tiles in my basement and they've been driving me crazy. Now I know what to do!